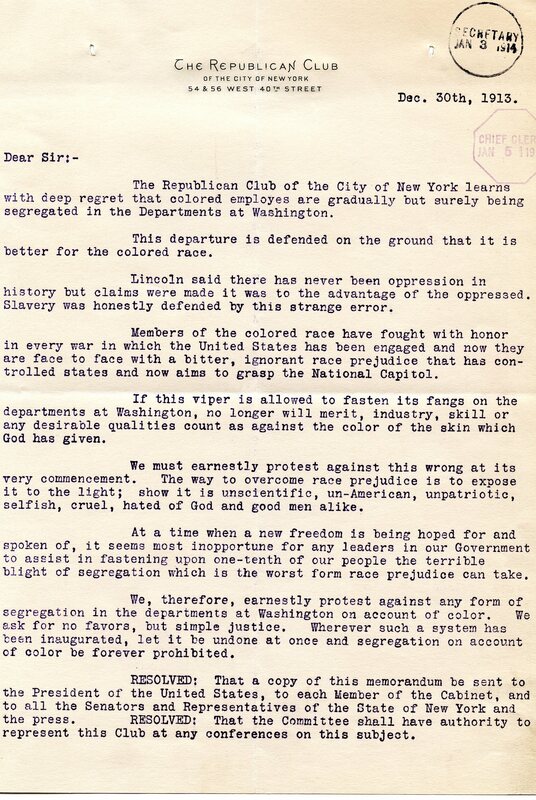 The Republican Club writes to urge an end to race prejudice and the segregation of African Americans in government department offices. 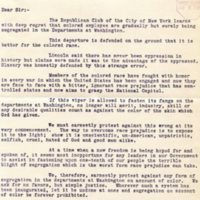 The Republican Club of the City of New York learns with deep regret that colored employes are gradually but surely being segregated in the Departments at Washington. This departure is defended on the ground that it is better for the colored race. Lincoln said there has never been oppression in history but claims were made it was to the advantage of the oppressed. Slavery was honestly defended by this stranger error. Members of the colored race have fought with honor in every war in which the United States has been engaged and now they are face to face with a bitter, ignorant race prejudice that has controlled states and now aims to grasp the National Capitol. If this viper is allowed to fasten its fangs on the departments at Washington, no longer will merit, industry, skill or any desirable qualities count as against the color of the skin which God has given. We must earnestly protest against this wrong at its very commencement. The way to overcome race prejudice is to expose it to the light; show it is unscientific, un-American, unpatriotic, selfish, cruel, hated of God and good men alike. At a time when a new freedom is being hoped for and spoken of, it seems most inopportune for any leaders in our Government to assist in fastening upon one-tenth of our people the terrible blight of segregation which is the worst form race prejudice can take. We, therefore, earnestly protest against any form of segregation in the departments at Washington on account of color. We ask for no favors, but simple justice. Wherever such a system has been inaugurated, let it be undone at once and segregation on account of color be forever prohibited. RESOLVED: That a copy of this memorandum be sent to the President of the United States, to each Member of the Cabinet, and to all the Senators and Representatives of the State of New York and the press. RESOLVED: That the Committee shall have authority to represent this Club at any conferences on this subject. Republican Club of the City of New York, “The Republican Club of the City of New York to William C. Redfield,” 1913 December 30, SC123013a, Race and Segregation Collection, Woodrow Wilson Presidential Library & Museum, Staunton, Virginia.